We are largely a nation of immigrants, and relatively recent ones at that. Waves of immigrants have come to the United States over the past several centuries, transforming the county from a colonial backwater to the wealthiest nation on the planet. A report just out shows how important immigrant business owners are to communities across the country. As can be seen below, immigrants are over-represented as business owners, and it turns out they make up a particularly large share of main street proprietors. The role that immigrants play as local business owners tends to be overshadowed in the policy debate surrounding immigration policy in the U.S. Amidst the talk about border security, paths to citizenship, and human rights, we tend to overlook the fact that immigrants are vital to the economic backbone of the United States, small businesses. 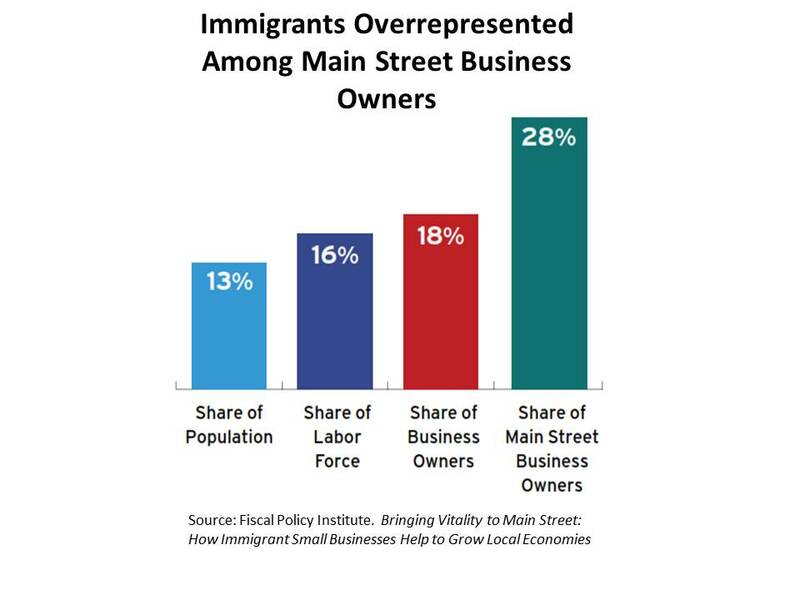 The Fiscal Policy Institute report shows that while immigrants make up 16% of the labor force, they own 28% of the main street businesses in the U.S. 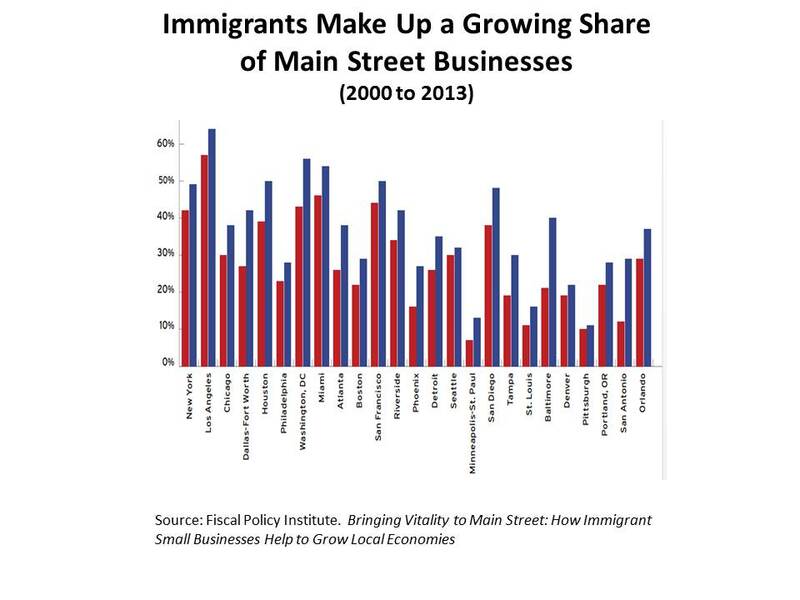 In many communities, immigrants make up a larger share of small businesses owners today than they did a decade ago, which is clearly shown in the graph below. Moreover, the report underscores how important immigrant businesses can be as early instruments of community revitalization, going into neighborhoods and communities when larger firms are still hesitant to invest. Immigrants are more important to metro small business communities than ten years ago. The report shows that the share of businesses owned by people born outside the United States has gone up in virtually every major metropolitan area in the country in the last 10-15 years. This includes both Charlotte and Raleigh, which saw marked jumps in immigrant small business ownership from 2000 to 2013. Immigrants are particularly likely to own very small businesses. More than 80% of businesses owned by immigrants had ten or fewer employees, compared to just over 70% for native-born business owners. Many of these immigrant businesses are in main street service sectors, like laundries, barber shops, restaurants, groceries, and travel accommodation. Immigrants are less likely to use a bank loan to start their businesses. Particularly on main street, native born business owners are more likely to get bank loans while immigrants are more likely to rely on personal savings. There are a host of reasons for this, but it is a point of concern. Access to capital is the lifeblood of small business, so if immigrants find it difficult to secure startup and operating capital, communities may lose businesses that are otherwise solid, or miss out of new businesses that never got off the ground. Case studies in engaging immigrant business owners show the importance of public policies in supporting the success of these entrepreneurs. The report highlights economic revitalization efforts in Philadelphia, Minneapolis/St. Paul, and Nashville that focus on the needs of immigrant business owners. When you take a sober look at the economic data, its clear that immigrants are essential to the economic well-being of the United States. Whatever you think about recent Executive actions, or what needs to be done about immigration policy generally, this is not an issue that we can afford to ignore. Immigrants have always been part of the U.S. economic history and, if we want to remain one of the most dynamic economic markets in the world, immigrants will be at the heart of those future stories as well.